In the heart of the Southern California desert, two hours from Los Angeles, lies a small, tranquil oasis with mineral pools and lagoon, aromatic garden, and time, blessed quiet, quality time to be undisturbed and productive, if you wish, or undisturbed and completely unproductive. It is a jewel in the sand. As such, it is the perfect spot for working or aspiring writers in search of comfortable isolation and solitude to jump-start creativity and get that project in gear. And if you've been looking at a pile of books you promised yourself to get to but haven't because the quotidian is cramping your style it is the ideal reader's retreat. The Hacienda Hot Springs Inn, located in Desert Hot Springs, is a boutique hotel with a relaxed Old World ambience. With only six cozy and attractive guest rooms you receive attention unlikely at larger hotels - if you want it - and never be annoyed by noise from other guests. Author Rachel Resnick calls it "a magical place...mind-bendingly gorgeous...blissed out...jellyfish relaxed....inspiring." Writers On Fire, which Resnick established to organize writer workshop-retreats, is holding one at the Hacienda Hot Springs Inn October 15-17 2010. Writers On Fire, which has held retreats in lovely spots around the world, will likely return to the Hacienda to accommodate the demand. The proprietor, William Dailey, knows from books, writing, and reading; William Dailey Rare Books has been an important part of the Southern California book community for close to forty years. Appropriately, he keeps a library of vintage books at the Hacienda. He's even written a bibliography on books about the Southern California desert. Full disclosure: I am a close friend and former employee of Mr. Dailey. I was present when Dailey originally bought the property; at the time it was a near-derelict dump. What he has done with it is nothing short of amazing; he has invested an enormous amount of time and money into developing the Hacienda into a world-class retreat. 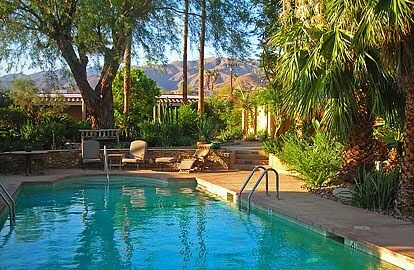 I was an early guest at the Hacienda Hot Springs Inn and have unforgettable memories of my stay there. Dusk falls on the Hacienda Hot Springs Inn. I have no doubt that you will, too. For writing, reading, to foster creativity in all its forms (or just to do nothing and do it well) the Hacienda Hot Springs Inn can't be beat.